I was fortunate enough to live in Chicago during the Bulls' six-peat championship run. Whenever my friends and I talked about the Bulls it was as a team. You can't mention Jordan without Pippen. Pippen ran interference so Jordan could make the big points. He would draw the defense allowing Jordan to make the shot. Pippen is the quintessential wingman. 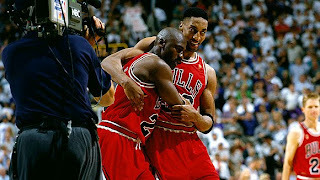 Last night, it occurred to me that a Father should be like Scottie Pippen. 'Cause let's face it. Mom is the superstar. She is the one that can make things all better. I realized this when we took my nephew to the zoo on Thursday. We let my nephew walk on his own. He noticed a peacock and immediately took off. Unfortunately my nephew's handling is not very good at high speeds. Needless to say he tripped, scraped his knee and began to cry. I hurried over to him and tried to comfort him but he didn't want me-he wanted his aunt. So after sulking over the rejection for a second. I did the next best thing. I cleaned his scraped knee while my fiance comforted him. It's not glamorous being the wingman, just ask Scottie Pippen, but it is just as important a role as the superstar.